William McKinley died at 2:15 this morning; his wounds were gangrenous, his heart could not act & everything was against him. He was a good, brave, noble man. 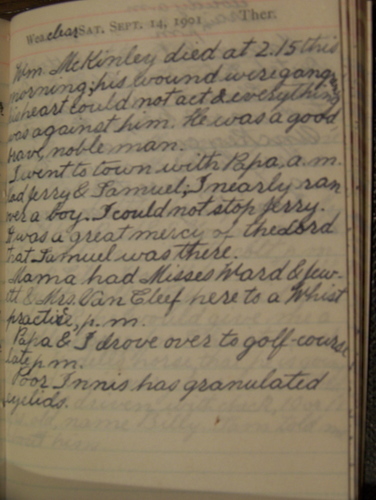 I went to town with Papa, a.m. Had Jerry & Samuel; I nearly ran over a boy. I could not stop Jerry. It was a great mercy of the Lord that Samuel was there. Mama had Misses Ward & Jewitt & Mrs. Van Cleef here to a Whist practice, p.m.
Papa & I drove over to golf course late p.m.
Poor Innis has granulated eyelids.